Driving around my former hometown of East Haddam, Connecticut (one of many since I was an army brat), I came across a glorious site. Right next to formerly grand home in need of repair, parked along the railroad tracks of the Essex Steam Train and Valley Railroad and right across the street of the old train station now gift shop was this vintage beauty – a pink Ford Edsel. The Edsel was an automobile marque that was planned, developed, and manufactured by the Ford Motor Company during the 1958, 1959, and 1960 model years. With the Edsel, Ford had expected to make significant inroads into the market share of both General Motors and Chrysler and close the gap between itself and GM in the domestic American automotive market. But contrary to Ford’s internal plans and projections, the Edsel never gained popularity with contemporary American car buyers and sold poorly. The Ford Motor Company lost millions of dollars on the Edsel’s development, manufacturing and marketing. The very word “Edsel” became a popular symbol for failure. Despite the negative connotations of the Ford Edsel, it really is a beauty of a car. Decked out in all manner of extravagance from the excessive chrome, the elongated lines and distinctive shield like front grill. I have to thank the owner for parking this beauty for me to discover. A few days later I returned to the same spot but alas it was gone. If there is one truism in photography it is to stop and take the shot when you see it. Don’t expect your subject to be there the next month, next day or even the next hours. I’ve had countless experiences where I’ve returned to a spot to find my subject moved, demolished or otherwise just gone. Because no one is going to follow them for you. I’ve been heading down to Westbrook, CT these past few weekends to help my parents clean out their house for a permanent move to Florida. Its a three hour drive and I’ve been trying to make the most of it by stopping along the way at some of the exits which have promising signage. Places that I wouldn’t stop with the family (got to get home do homework or make it to a game) or with the dog in the car. Far too often photography is a solitary endeavor when one can have their mind free and clear to see the images. This time I got off at Greenfield, MA, my “check engine” light flipped on and my “cruise” control light started blinking so I figured I might want to stop and check things out. Oil was fine, gas cap screwed on tight, nothing leaking under the car. So I figured I’d be alright but maybe I should let the car cool off a bit. I saw a sign for the Hallmark Museum of Contemporary Photography (which the photography school in Turner Falls, MA) and decided I might as well point the car in that direction so I put it on the GPS. Never did make it. An old factory caught my eye as well as a local sculpture park. I can never pass up funky artwork or abandoned buildings so I walked around and checked things out. While I was photographing the old abandoned and fenced off factory building a guy who was mowing the lawn motioned me over – “Are you photographing for work or hobby?” he asked. Kind of a strange question but my spider sense told me that hobby was the less threatening of the two choices. I didn’t know what was going to come next. Did I have a permit or something? He said “Come here I want to show you something” and motioned over to the bushes. Hmmm, I was getting a bit nervous at this point. It was a rather out of the way and crummy area. But it turns out he just wanted to show me the newly hatched snapping turtles that he nearly decapitated with his mower. I thank him for showing me his discovery and went through the motions of photographing the cute little buggers. I hadn’t brought my macro lens but I did have my Panasonic LX5 which has a great macro capability. 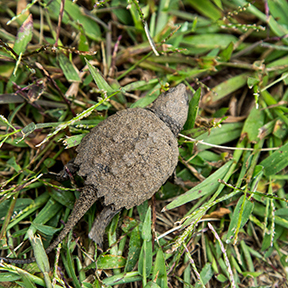 Freshly hatched baby snapping turtle already escaped death by lawn mower. I put the baby snapping turtle safely back in the brush on the river side of the road. Then it started to rain so I decided it was about time to get back on the road, that’s when I discovered on of my favorite shots of the day – a classic Ford Galaxy 500 parked on an empty street with classic New England triple decker houses. It was just too perfect. Empty street, the rain, classic car, classic background! I just love seeing vintage cars “in the wild” as my engineering friend and car buff says. The rain put an extra bleak look on the whole image. You just never know what you’ll find around the corner. This whole area of western Massachusetts has that old mill town feeling that photographer Gregory Crewdson loves to use in his work – like in the books Twilight, Beneath The Roses and the documentary about his work – Brief Encounters. If you get a chance to see “Brief Encounters” do so! It’s fascinating. 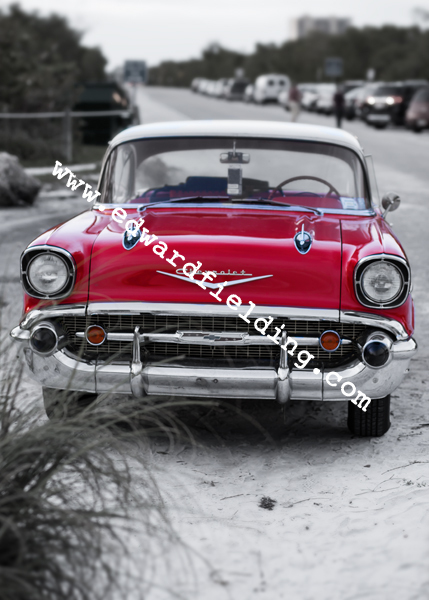 Edward M. Fielding is a fine art photographer in the Upper Valley region of New Hampshire. One of my most popular images, Vintage Sunflowers is available to the first 25 buyers for the next five days via Fine Art America. Specially priced 20.00″ x 24.00″ stretched canvas print of Edward Fielding’s Vintage Sunflower for the promotional price of $100. Last year, a friend of mine showed me photos of a local car show in his hometown and I was blown away by the number of vintage cars attracted to main street Marlborough, MA. Located just inside the 495 belt around Boston, sleepy Marlborough isn’t known for much other than being a bedroom community for Boston and the technology companies that ring this major metropolitan area. But the annual spring car show on the historic main street puts Marlborough on the map among car fanatics. The United Brethren Masonic Lodge was chartered 1859 in Marlborough, Massachusetts. To celebrate their 150th Anniversary in 2009, the Lodge decided to host a car show and worked with the City of Marlboro as well as the Push Rods of Waltham. The event was so well received that it has since become an annual tradition and continues to grow in popularity. None of this would be possible without the support from the City of Marlborough and the business community that sponsors the event making it free to the general public. This is a non-profit event whereby each year all proceeds are donated to a chosen charity. And the show keeps growing every year. The recent show coincided with a gorgeous summer-like day with bright sun and a cloudless sky, which brought over 300 cars to the downtown. Starting at 9 am, they parked up and down the main street and even filled in side lots. And they kept coming through out the day. We started down one side of the street and had to keep stopping to take photos of the newly arrived cars. It must have taken two hours to see all the cars – heavy on the muscle cars and American makes – Mustangs, Roadrunners, GTOs, Cameros, Cobras but there were all sorts of cars from the 30s, 40s, 50s and 60s including a few Europeans like Porsche, VW, and even a 1930 Bugatti open cab race car. The Batmobile was there as well dune buggies (3! ), VW Campers, drag racers and heavily modified hot rods as well as a few Factory Five AC Cobra kit cars. According to the press kit, this is one of the first car shows of the season so a lot of car owners who have garaged their car all winter, can’t wait to show them off at this annual event. Or simply click on the photograph. 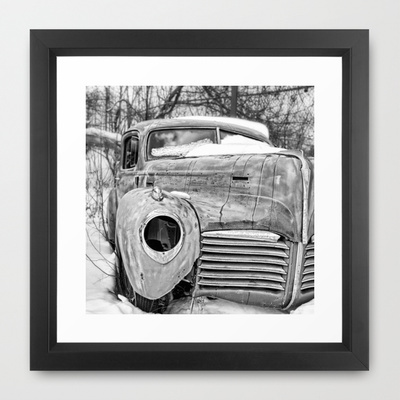 Click through to check out my gallery of over 100 classic vintage cars.